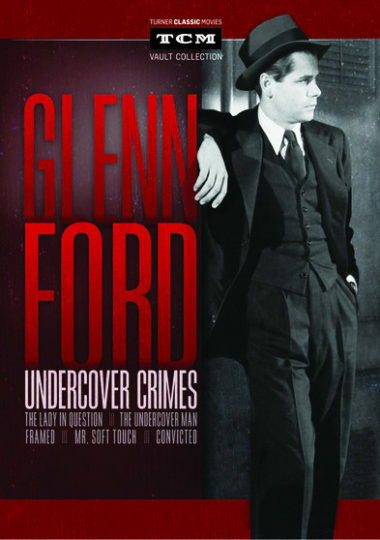 Turner Classic Movies and Sony Pictures Home Entertainment proudly present Glenn Ford: Undercover Crimes, an unprecedented collection of five fully restored and re-mastered crime classics never before released on DVD. Unemployed mining engineer Glenn Ford gets hit upon by femme fatale Janis Carter, who’s out to make him the fall guy in banker boyfriend Barry Sullivan’s big-money swindle, in “Framed” (1947). Edgar Buchanan, Karen Morley co-star. T-man Ford finds the lives of his family threatened when the gang boss he’s trying to finger for tax evasion starts pushing back in the gritty procedural “The Undercover Man” (1949). Nina Foch, James Whitmore co-star. “Convicted” (1950) on a manslaughter rap due to ineffective counsel, Ford is made a trustee by sympathetic warden Broderick Crawford. Dorothy Malone co-stars. Also includes “The Lady In Question” and “Mr. Soft Touch.” 5 DVD Set. Glenn Ford, Rita Hayworth, Brian Aherne, Evelyn Keyes, John Ireland, Nina Foch, James Whitmore, Broderick Crawford, Millard Mitchell, Dorothy Malone, Janis Carter, Barry Sullivan – BW – 429 Minutes. Digital Bonus Features on the DVD Include: Introduction by Ben Mankiewicz, TCMDb Article, Digital Image Gallery of Movie Posters, Scene & Publicity Stills, Behind-the-Scenes Photos, Lobby Cards.